'You know," Karen White '85 says with a grin, "I was always that ob nox ious kid who liked reading aloud in front of the class." Only now, she gets paid for it. An audiobook narrator, The L.A.-based White has given voice to an eclectic array of volumes, more than a hundred in all—sci-fi and self-help, business tomes and political polemics, biographies of subjects from Elvis Presley to Joan of Arc. A classically trained actress with a voice that AudioFile magazine calls "more contralto than soprano," she has risen to the top of her profession over the past fourteen years. For her work on Annette Gordon Reed's The Hemingses of Monticello—a history that won both the National Book Award and the Pulitzer Prize—White garnered a 2009 Audiobook of the Year award. Reviewing her recording of Barbara Demick's Nothing to Envy: Ordinary Lives in North Korea (itself a National Book Award finalist), Publisher's Weekly opined that she "delivers a stunning read, her character interpretations are confident and well-rounded, and she forges a strong bond with the audience." White's choice of material often reflects her upbringing. She is drawn to southern fiction, especially stories that take place in Kentucky, Virginia, or North Carolina—all states where she was raised. Along with reading and acting, she spent much of her childhood riding horses. She was initially attracted to Cornell because of its vet school and played polo as a freshman—so it's no surprise that her list of audiobooks includes titles like Saddled: How a Spirited Horse Reigned Me In and Set Me Free and You Had Me at Woof: How Dogs Taught Me the Secrets of Happiness. After majoring in theater at Cornell, White was an artist in residence with Shakespeare & Company in western Massachusetts before earning an MFA in acting from Brandeis. In her theater days, she prided herself on having a broad range; in a single show—Holiday Memories, based on Truman Capote's memoirs—she played a twelve-year-old girl, a ninety-year-old woman, and a barking dog. It was good training for inhabiting a book's entire cast of characters. She moved to Los Angeles in 1997 and did some on-camera work. 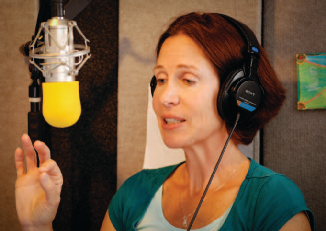 But when a friend suggested she lend her voice to audiobooks, she found her calling. "When ever I read a book, I hear it in my head," says White, who was named one of AudioFile's Best Voices of 2010. "It's always been like that. My theory is that everyone's imagination works through different senses, and that's how mine works." White does extensive pre-narration preparation, including making a spreadsheet of pronunciations and a log of phrases that describe each character— physically, emotionally, and biographically. Her task is made more difficult when, as happened in a recent mystery novel, the text includes lines like, "He sounds like he's from a foreign country, but it's hard to say where." White notes that nonfiction is often particularly challenging—she has tackled such titles as Too Good to Be True: The Rise and Fall of Bernie Madoff by Erin Arvedlund and Give Me Liberty: A Handbook for American Revolutionaries by Naomi Wolf—and that fact-laden academic tomes, in particular, aren't necessarily intended to be read aloud. "They're meant to be pored over, studied, or highlighted," says White, who credits her Shakespearean training with helping her conquer lengthy sentences. "They're not usually written with the music of the language in mind." White doesn't al ways agree with the words she's saying—as evidence, she offers her narration of three books by right-wing political pundit Ann Coulter '84—or even know exactly what she's talking about; she says that to understand a study of the human genome that she recently narrated, "you'd have to have a PhD in genetics." But she always strives to make a connection. Her mantras: Be in the moment. Be emotionally honest. Don't force a shift in pitch or pace, but let it come naturally via a change in attitude. "I'm not really a creative artist the way a writer is, but I'm still kind of in charge," says White, who occasionally directs other audiobook narrators. "I have so much more control over the final product than an actor ever does." White gets paid per hour of completed narration, and each recorded hour generally requires about two hours of work. She records for no more than six hours per day, using a virtually soundproof booth that she and her husband, a Hollywood sound mixer, constructed in their garage. She starts with a full vocal warm-up including articulation exercises ("unique New York; unique New York") and reads from an iPad to avoid shuffling paper. She edits as she goes along, so the recording she submits is relatively clean. Then an editor tweaks it—adjusting timing and removing extraneous breaths, for instance—and a proofer checks for errors and accidental background noise. White then re-records any corrections before final mixing and mastering. "Audiobooks don't make as much money as other entertainment forms, so there's time pressure," she notes. "You can't get every little thing perfect." Occasionally, White gets to play to a wider audience. In October, "CSI: Miami" aired an episode in which a millionaire author's housemaid is found hanging from a chandelier, drained of blood and with bite marks on her neck. The clue that solves the case comes from one of the novelist's best-selling vampire books—in an epilogue included only in the audio-book version. "The killer," White's voice reveals as two forensic investigators listen intently, "knew exactly what to do . . ."
Hear Karen read from "Plea of Insanity"